Very first objects created in universe spotted? These light patterns were hidden within a strip of sky observed by NASA's Spitzer Space Telescope. These two panels show the same slice of sky in the constellation Bootes. 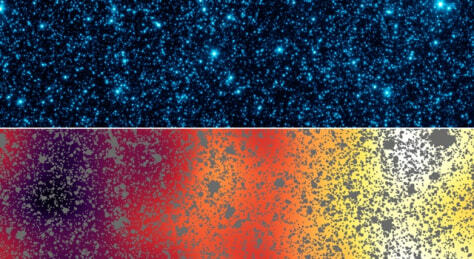 The top panel show's Spitzer's initial infrared view of this patch, including foreground stars and a confusion of fainter galaxies. In the lower panel, all of the resolved stars and galaxies have been masked out (gray patches), and the remaining background glow has been smoothed and enhanced. This processing reveals structure too faint to be seen in the original image.